I was at the farmer’s market yesterday and saw that sour cherries are still available around here. 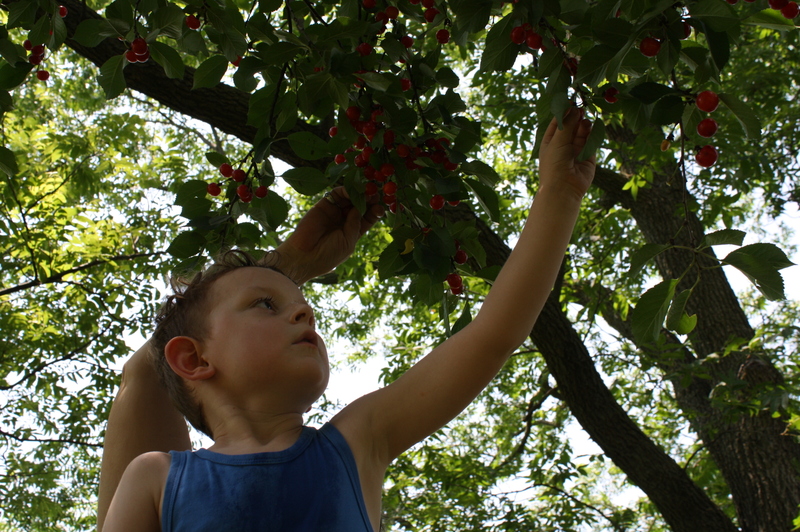 I was surprised, because I know that sour cherries are only available for a short while…and we picked ours a month ago! But of course I wasn’t thinking about the fact that there are a few different varieties of them, and the ones available now are a darker red shade, but still just as sour. So, I wasn’t going to post this recipe because I thought the season was over, but we’re in luck around here! Grab some this weekend and bake these…I promise you won’t be sorry. The crust is heavenly, and I love hand pies because the crust to filling ratio is perfect. And these are a perfect dessert to bring to your friend’s BBQ! No serving hassle at all…just put them on a plate and watch them disappear. Whisk together flour, sugar and salt in a large bowl. Using a pastry blender, two forks, or your fingertips, work the butter into the flour until the biggest pieces of butter are the size of tiny peas. Gently stir in 3/4 cup buttermilk with a rubber spatula, mixing it until a craggy mass forms. Using your hands, knead it just two or three times to form a ball. If it doesn’t come together, add remaining 1/4 cup buttermilk, 1 tablespoon at a time, until it does, then gently knead again. Divide dough in half. Wrap each half in plastic wrap and flatten into a disc. Chill in fridge for at least an hour or up to two days or slip plastic-wrapped dough into a freezer bag and freeze for up to 3 months. Place cherries and sugar in a medium saucepan with sugar and tapioca and stir to combine. Cover and cook at medium-low heat for 15 minutes, no need to stir. Increase the heat to medium, remove the lid and cook for another 10 to 15 minutes, until thick enough that if you run a spoon across the bottom of the pot, you can see a trench quickly form and disappear. Spread mixture on a large plate in the fridge or freezer to cool quickly, then scrape into a bowl. 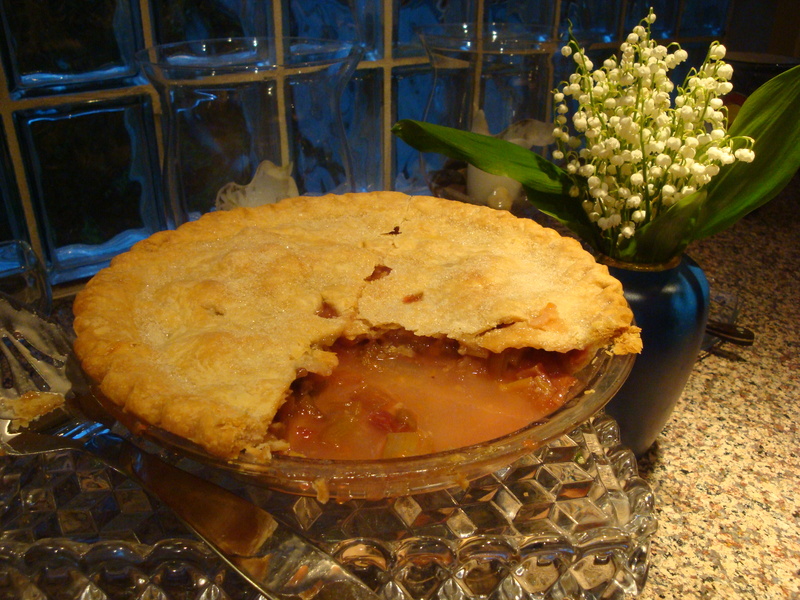 Keep cold until needed; it will be thicker and easier to “scoop” onto the pie bases. Beat cream cheese, sugar, zest, juice and yolk together in a small bowl with an electric hand mixer until smooth. Keep cold until needed. Heat oven to 400 degrees. Line two to three baking sheets with parchment paper. Beat your remaining egg and 1 tablespoon water and keep aside with a pastry brush. Dust your counter or pastry mat with a lot of flour, unwrap the first half of your dough and start rolling your dough by pressing down lightly with the floured pin and moving it from the center out. Be patient about rolling, don’t press too hard, and it won’t crack as easily. Roll until 1/8″ thick. I cut mine into circles using a 3″ biscuit cutter, but you can also cut into 3″ squares using a pizza wheel or pastry cutter. You won’t have as much dough scraps left if you cut into squares, but I really wanted rounds. If doing rounds, you’ll have quite a bit of scraps, which you can form back into a ball, refrigerate for 30 minutes, and then re-roll and cut some more. It will make for slightly tougher crust on those, but I didn’t think it made that big of a difference. If your dough becomes soft, slide onto baking sheets and freeze for 15 minutes. It will make it easier to assemble. We really love coconut around here. It seems like every other yummy treat I make has coconut in it. Last week I made coconut almond granola (just tweaking my original granola recipe a bit, taking out cashews and maple flavoring and adding coconut extract and slivered almonds), and coconut cream pie. 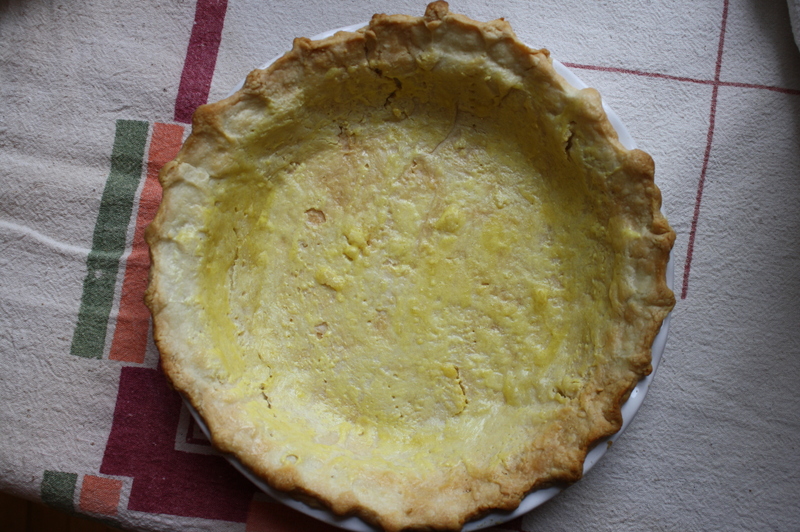 Whenever I make a quiche, which is what we had for dinner last Thursday, I make a full recipe of pie dough and save the other half for a single crust pie. 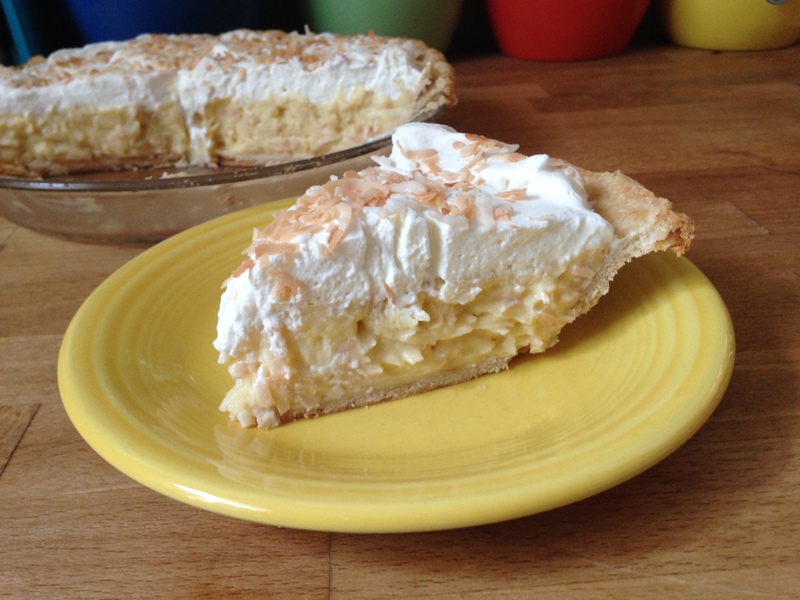 I can’t believe this is the first time I’ve made coconut cream pie…it’s one of my favorites! This recipe is simple, classic, and delicious. Prepare a baked 9″ pie crust. My favorite recipe is this. Prepare the coconut: Spread 1 1/3 cups shredded sweetened dried coconut in a 9″ cake pan and toast, stirring occasionally, in a 300 degree oven until golden brown, 20-30 minutes. Set aside. Whisk together the sugar, cornstarch and salt in a medium heavy bottomed saucepan. Gradually whisk in the milk. Vigorously whisk in the egg yolks until no yellow streaks remain. Place over medium heat and bring to a bare simmer, stirring constantly with a wooden spoon or rubber spatula. Remove from the heat, scrape the corners of the saucepan with the spoon or spatula, and whisk until smooth. Return to the heat and, whisking constnatly, bring to a simmer again and cook for 1 minute. Off the heat, whisk in the butter, vanilla and coconut until the butter is melted and completely incorporated. Stir in all but a few tablespoons of the coconut (set the rest aside for later), and then spoon the filling into the prepared pie crust. Press a sheet of plastic wrap directly on the surface and cool to room temperature. Move the pie to the refrigerator and refrigerate for at least 3 hours. Beat 1 cup whipping cream and 1 tsp coconut extract on high speed in a stand mixer with the whisk attachment, adding sugar to taste as it’s beating, until stiff peaks form (I like my whipped cream on the less sweet side, so I only add about 1-2 tbsp sugar). 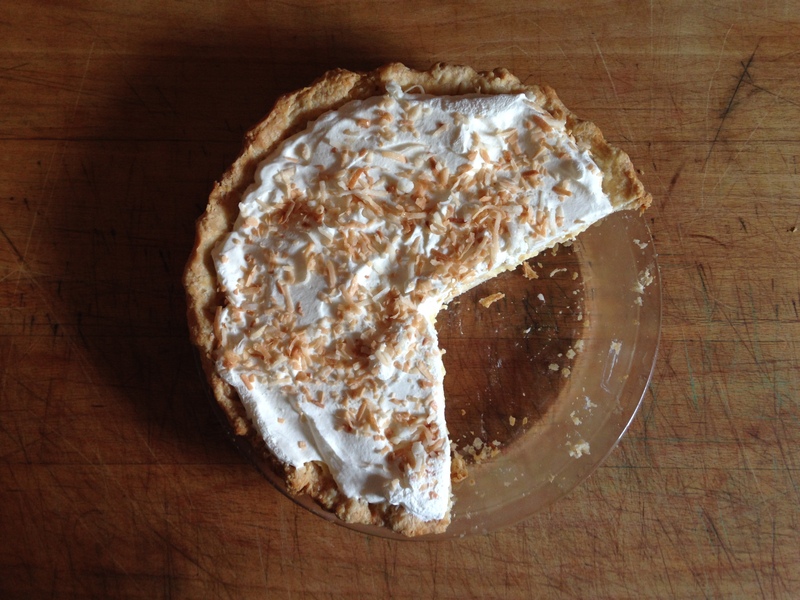 Top the cold pie with whipped cream, and then top the whipped cream with the reserved toasted coconut. Serve immediately. It will keep, sealed with plastic wrap and refrigerated, for a couple of days. 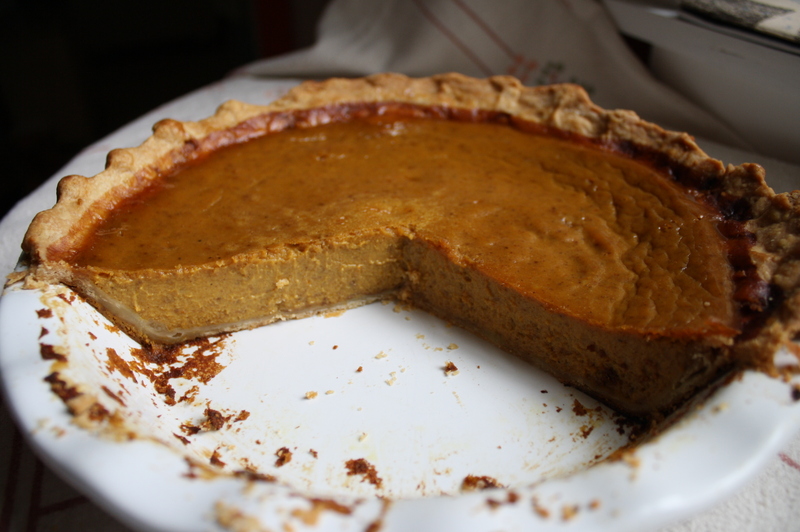 Pumpkin pie is one of my favorite pies, and we have them at our house more than just for Thanksgiving. I like to use Joy of Cooking’s recipe, which yields a crispy, flaky crust, and custardy, delicious filling that’s not grainy or soggy. The key is the blind-baked crust, which is pre-baking your pie crust lined with foil and pie weights. I like to do this with all of my one-crust pies, ever since I read about it in Joy. It really does produce superior results. I have made only a few pumpkin pies in my time. It seems for holiday gatherings, others make the pumpkin and I bake apple or pecan-sweet potato pie – like this Thanksgiving! And I usually follow Mom/Granny’s lead and use the recipe on the side of the can of pumpkin. 🙂 I’ve always been satisfied with the results, but then I’ve never had this version! One thing I will say is that I think pumpkin pie is best made with canned pumpkin. Every time I’ve had it with fresh pumpkin puree, it seems watery. How about you Margaux? What are your thoughts on fresh vs. canned pumpkin? I definitely ALWAYS use canned pumpkin. Not only does it seem watery with fresh, but often grainy and stringy. Yuck. It’s really not worth the extra step, because canned pumpkin is just that…pumpkin, no additives. 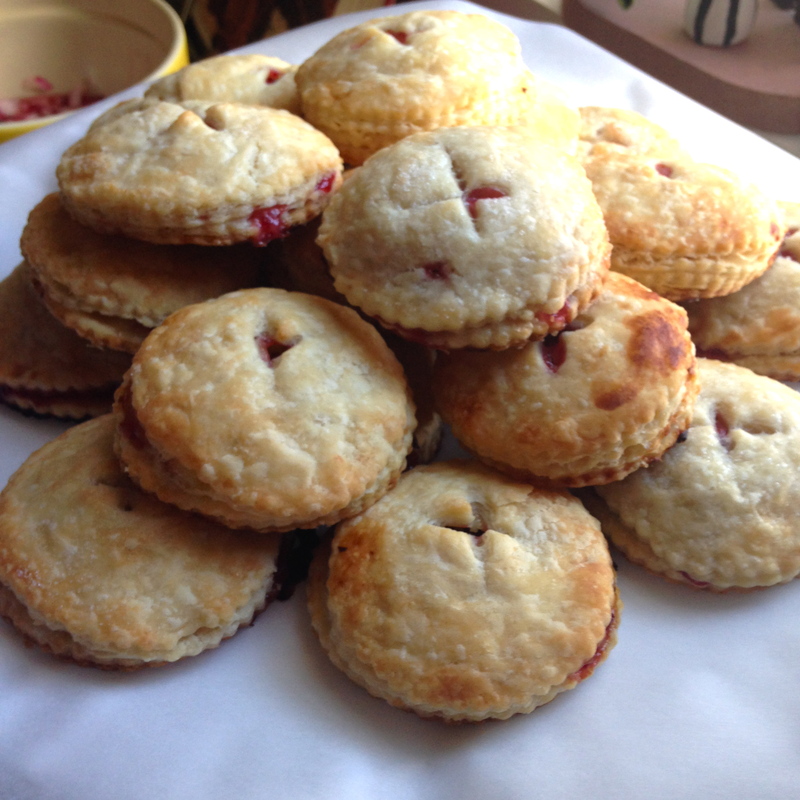 You would have to have commercial grade equipment to get it the consistency that canned is, which is perfect for pies. I was happy to see that there was a little section about it in the November issue of Martha Stewart Living…their test kitchen came up with those same results. Roll out pie dough. 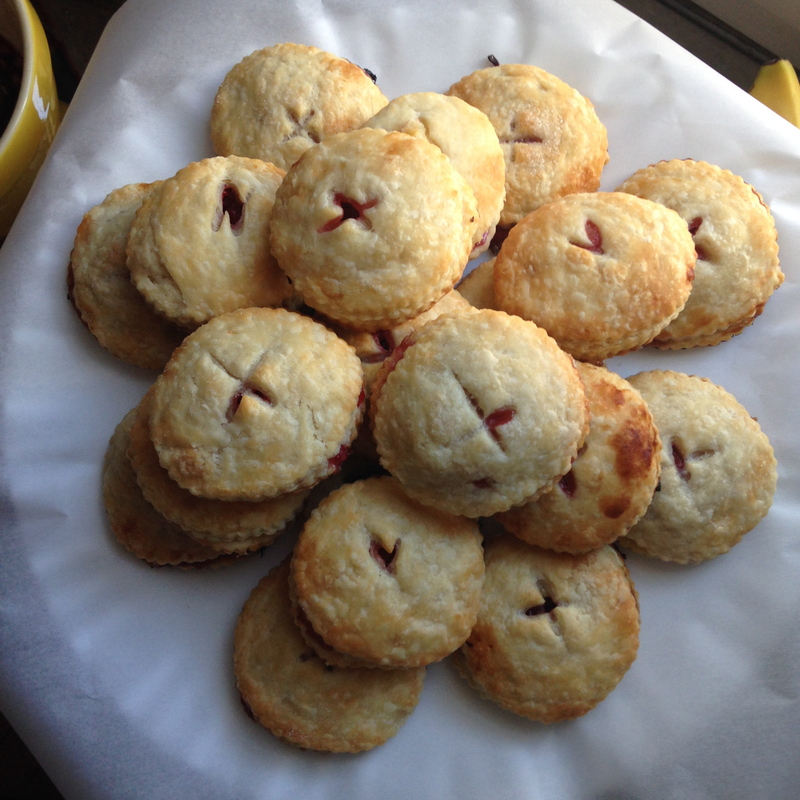 Carefully place it in a 9″ pie plate, trim the edges leaving a 1″ hang over, fold it under and crimp. Place in freezer and freeze for about 10 minutes. Meanwhile, preheat oven to 400 degrees. 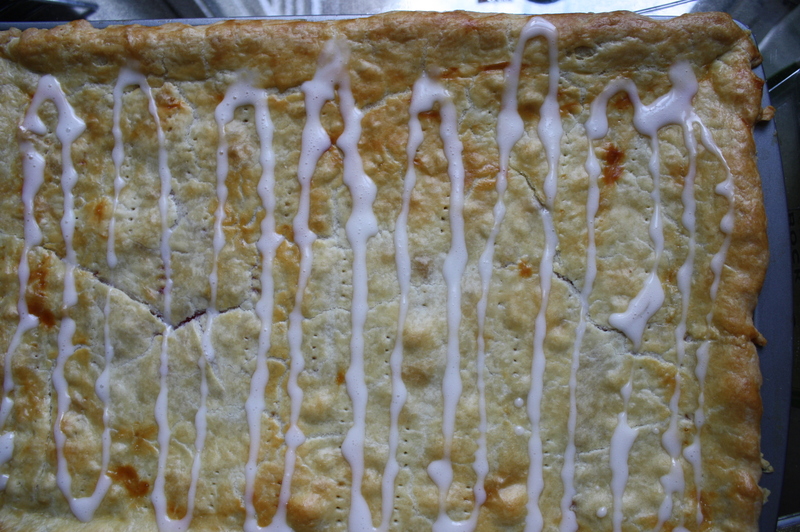 Take pie shell out of freezer and cut a large piece of aluminum foil. Place foil into pie plate, shiny side down, carefully pressing it into the corners and leaving a good amount hanging over the sides. 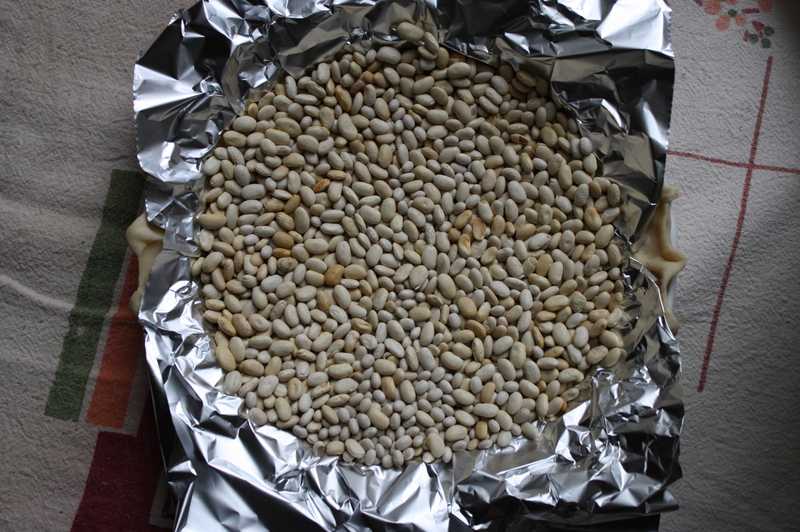 Fill with pie weights, dried beans or rice (I keep dried beans on hand and use them over and over again). Bake in preheated oven for 20 minutes. Remove from oven, and carefully remove foil. Prick crust all over with fork and put in oven again for another 5 minutes or so, until the crust is golden. Meanwhile, beat egg yolk with a pinch of salt. When crust is done, brush with egg yolk all over and bake for another minute or two, until the glaze is set. A note about eggs in the recipe: If you like your pie more custardy, use 3 eggs. If you like a stronger pumpkin flavor and a denser filling, use only 2. I like to use 3. Whisk eggs together in a large bowl. Add the rest of the ingredients and mix well. While mixture is sitting for a few minutes, place foil around the fluted edges of the crust (or use an aluminum pie sheild…one of my favorite kitchen gadgets). Warm crust back up by placing it in the oven for 1-2 minutes, until it is hot to touch. Pour filling into the hot crust, place in oven and bake for 40-50 minutes, until center seems set but quivery, like gelatin, when you tap the side of the dish. Cool on a cooling rack to room temperature. Serve within one day, store in the refrigerator. Place all ingredients in the bowl of a stand mixer fitted with the whisk attachment. Beat on medium high until soft peaks form, no longer. 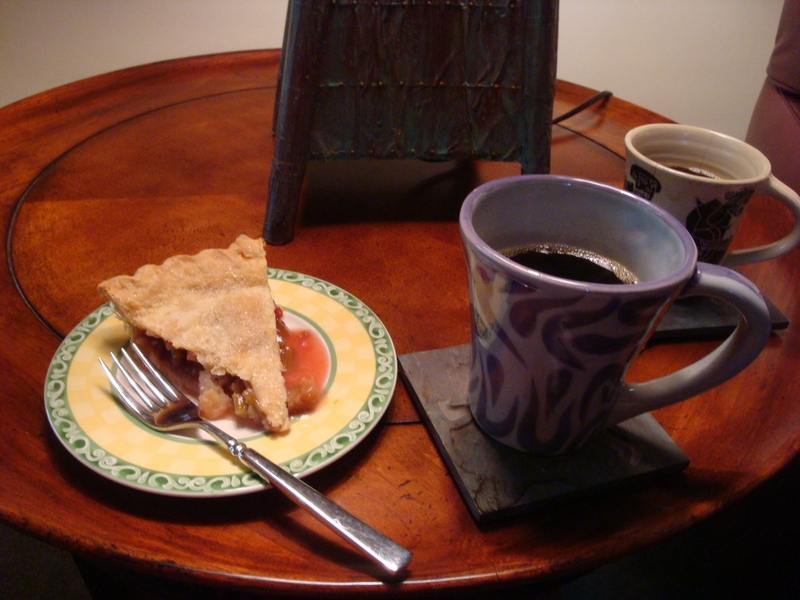 Serve dollops on slices of pie. Store remainder in refrigerator in airtight container. Whip with a wire whisk for 10-15 seconds when ready to use again. My family has a farm that dates back to the mid-1800’s. We call it “the Big House.” It is pretty big, and one of my aunts lives in it now. It is one of my favorite places on earth. 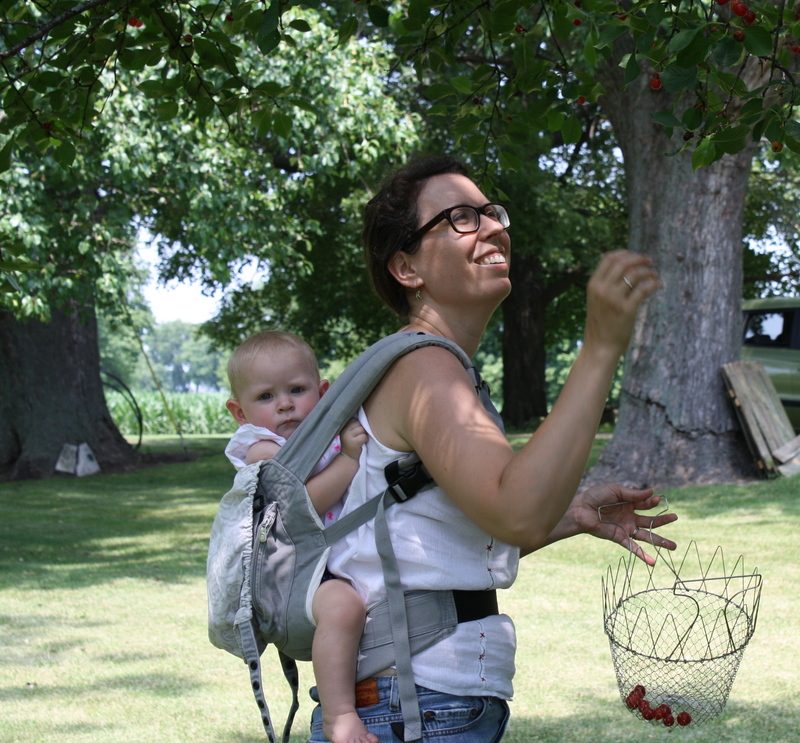 There are two Montmorency cherry trees there that were planted in 1967 for my Aunt Gigi’s birthday, and this year we just happened to be down in central Illinois when the cherries were ready to be picked! 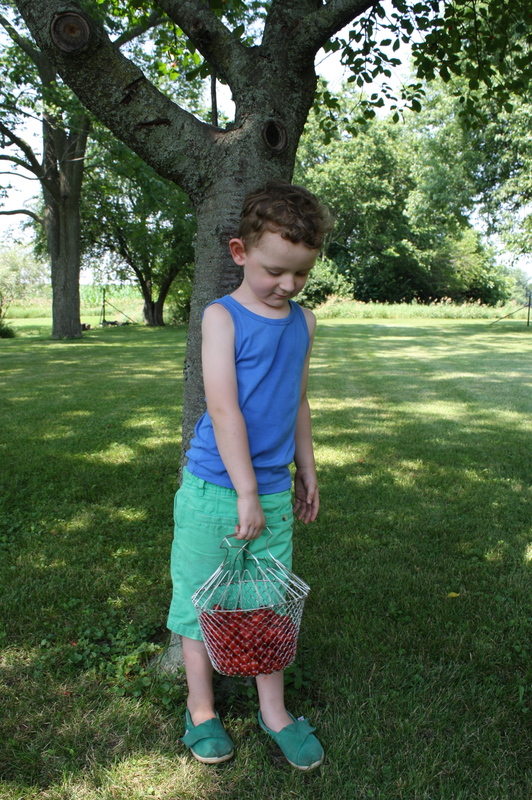 We got just enough cherries before the kids started going bonkers (Stella seriously needed a nap). 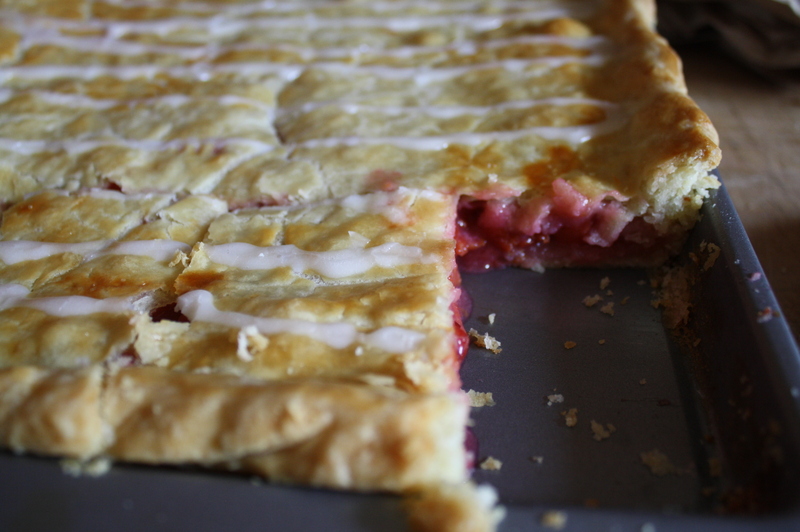 I always make pie with the cherries, and this year I really wanted something different. While browsing Smitten Kitchen (I really used a lot of her recipes this week! ), I came across this one. OMG I will be making this again!!! You really should try it before this very short cherry season is over! (It might already be…it’s taken me way too long to get around to writing this). On a lightly floured surface, roll out the larger piece of dough into an 18-by-12-inch rectangle. In a medium bowl, stir together confectioners’ sugar and milk, water or lemon juice (or combination thereof) until desired glaze consistency is achieved. Use a spoon to drizzle over top. Serve warm or room temperature. When I saw the recipe for this pie, I had to make it. I’ve never had apricots in pie before, and the combination of coconut and apricots was intriguing. The combo does not disappoint…it’s really delicious! 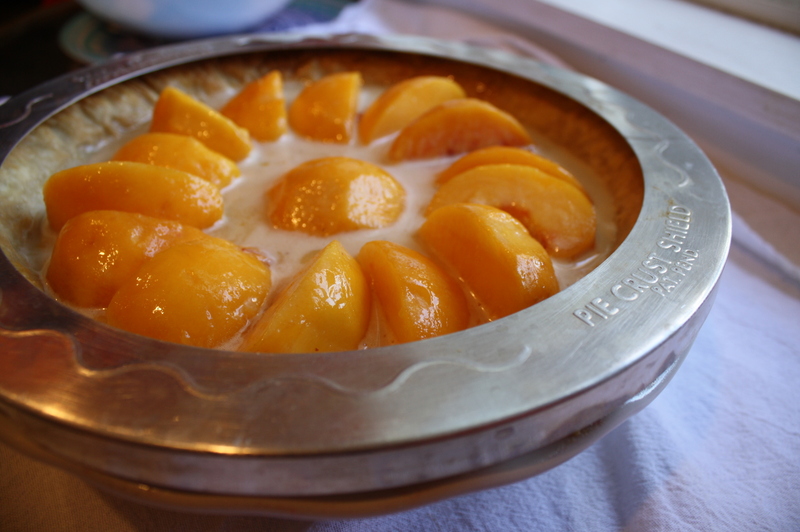 I love the tartness of the apricots with the sweetness of the crumble. 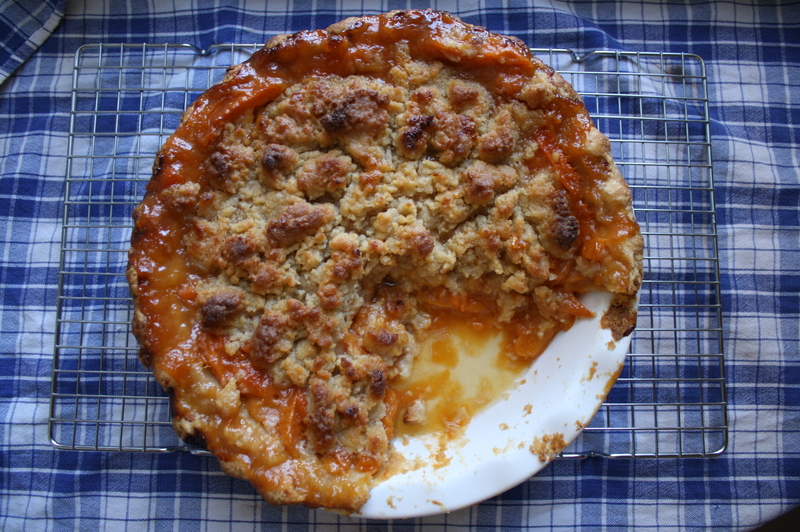 The pie is pretty easy to make, too; the crumble can be made in a food processor and you don’t have to peel the apricots, so prep time is minimal. The Martha Stewart version also has shaved toasted coconut piled on top in the center for a lovely decorative touch (which I did not take the time to do). Make the topping: Whisk together flour and 1/8 teaspoon salt. Pulse coconut in a food processor until finely ground. Add butter and brown sugar, and pulse to combine. Add flour mixture, and pulse until clumps form. 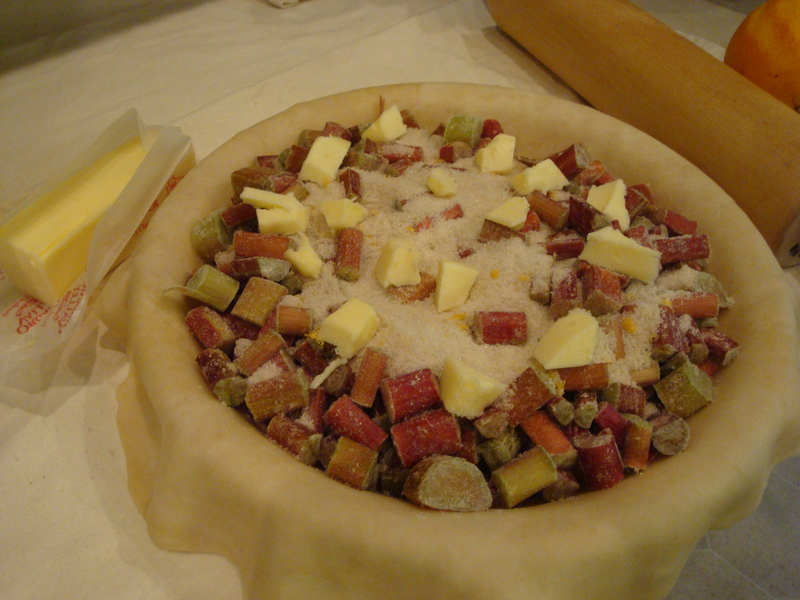 Make the crust: Roll out pie dough to a 1/8-inch thickness on a lightly floured surface. Fit dough into a 9-inch pie plate, and trim crust to a 1-inch overhang using kitchen shears. Fold edges under, and press to seal. Crimp as desired. Freeze for 15 minutes. Make the filling: Stir together apricots, sugars, cornstarch, and 1/4 teaspoon salt. Pour filling into piecrust. Sprinkle with topping, squeezing some of the mixture into medium to large clumps and leaving a 1-inch border. Bake pie on middle rack, with a foil-lined baking sheet on bottom rack to catch juices, until vigorously bubbling in center and bottom crust is golden, about 1 1/2 hours. (Loosely tent topping with foil after 30 minutes to prevent burning.) Transfer pie to a wire rack, and let cool for at least 2 hours (preferably longer) before serving. When my guy Tatum told me he was making a pie for Pi Day (today, March 14) to take to his workplace, I thought he meant Pie Day. I had never heard that there was a day set aside for ∏!! And to think it’s also Albert Einstein’s birthday, making this a true day for smarties. Then he told me he was making his famous chocolate cream refrigerator pie which is made with a surprise ingredient – tofu! I had never had this pie and I had my doubts, but it is super-chocolaty and delicious. Lucky co-workers! This pie is sooo delicious! 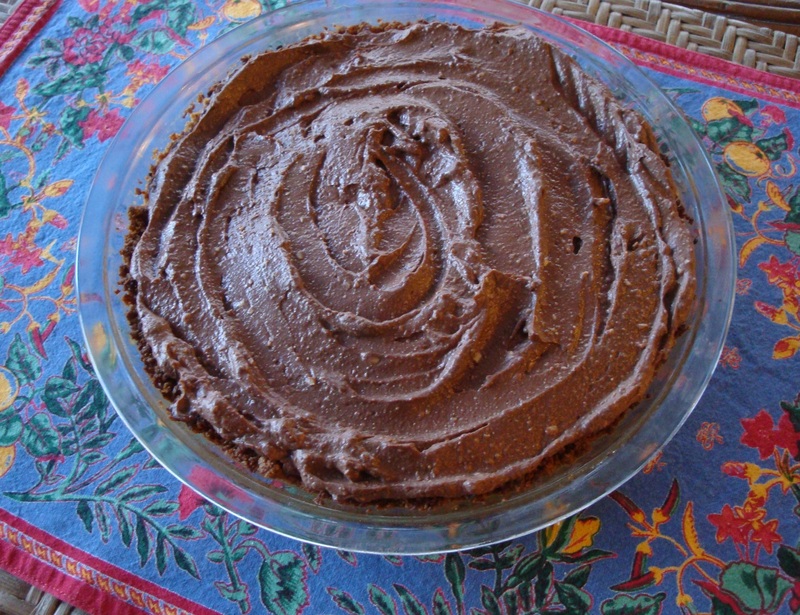 It’s very rich and tasty…it almost makes me think of chocolate cheesecake more than a traditional pudding pie. If you want to make it vegan, just substitute agave syrup for the honey. I made it with my own granola recipe, and the slightly-saltiness of the granola really paired perfectly with the super sweet and rich filling. 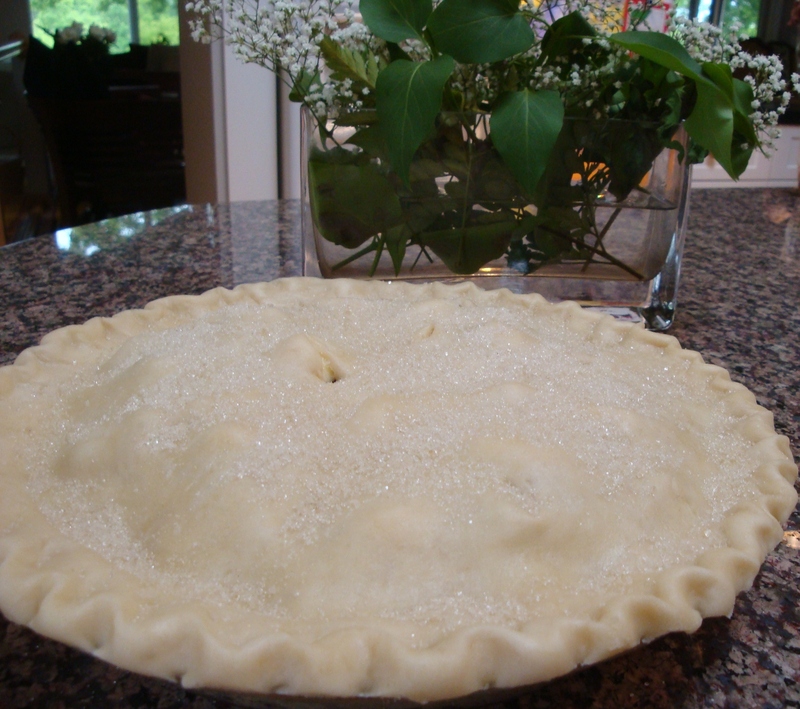 This is a great pie to make when you want something sweet but don’t want to have the oven on for more than 30 minutes! Process the granola for 15 seconds in a food processor or with a stick blender. Add the melted butter or canola oil and the honey. Press into a 9-inch pie plate. Bake at 400° for 5–7 minutes. Keep an eye out so it doesn’t burn. Remove from oven and set aside to cool while making the filling. Melt the chocolate in a double boiler until smooth. Stir in the honey and blend thoroughly. Process the tofu in a food processor or with a stick blender until smooth. (Note: some tofu is sold in 12-ounce packages. In this case just use 21 ounces.) Add the melted chocolate mixture and beat by hand till smooth and creamy. Pour the filling into the reserved crust. Cover with plastic wrap and refrigerate overnight. 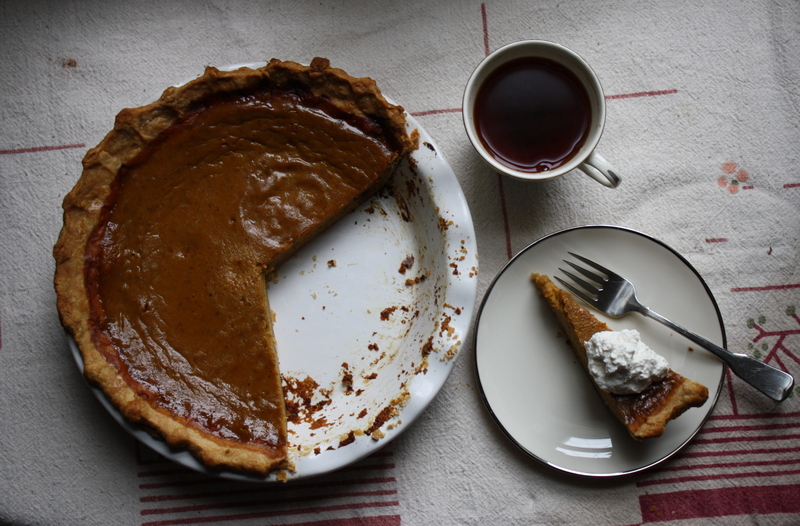 Be judicious with serving size – this is a very rich pie!